Getting the rest you need at night is important for your health and well-being! 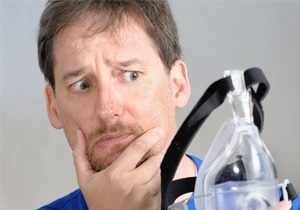 For patients who suffer from sleep apnea, the medical standard of care is CPAP, or continuous positive airway pressure therapy. However, since this treatment entails wearing a mask while you sleep, it can feel uncomfortable or even claustrophobic for some patients. Patients who have difficulties with CPAP may benefit from oral appliance therapy in Herndon for their sleep apnea treatment. Dr. Dilolli utilizes a variety of oral appliances that are customized to align perfectly with your teeth and provide a fit that is similar to an orthodontic retainer or a mouth guard. Made of soft acrylic material, these oral devices offer you optimum comfort while positioning the lower jaw forward to prevent the soft tissues in the throat and the tongue from collapsing to block your airway during sleep. Oral appliances are immediately effective and provide relief right away for most patients. They are also typically more comfortable and easier to get used to than a CPAP device. TheraSnore – This is an anti-snoring guard that is adjustable and available in a variety of arch sizes. Snore Guard – This FDA approved device is most effective in dealing with cases of mild to moderate sleep apnea and snoring. EMA – Custom – An oral appliance that is quite effective since it is customized by adjustable elastic straps which make positioning the jaw forward comfortable. PM Positioner (Adjustable) - Preferred by majority of patients for its ease of use, effectiveness and durability. With this device your tongue will have some extra space and your jaw will have the liberty to afford some movement so you do not feel locked into a certain position. TAP3 - You or your doctor are able to adjust the TAP3 while it is in the mouth. A lot of patients have reported immediate results from its use their first night. Given its easy tolerance level, about 90 percent of the patients wear it all night. SUAD - This is an appliance that has acrylic material strengthened by a metallic structure. The device has a piston that rests at the side of the mouth used to adjust its position. It permits free jaw movement and it’s an excellent option for those patients who are used to grinding their teeth. SomnoDent - This oral device is often recommended for patients with mild or moderate sleep apnea and those with slight snoring problems. It usually provides some extra space for the tongue and is thus recommended for those who have a narrow arch. For patients who need the benefits of a CPAP device, but don’t want to wear a mask while they sleep, a nasal pillow mask may be the solution. This device uses head gear to secure it around your nose without having to cover the mouth. A nasal pillow mask can also work well for patients who want to combine CPAP and oral appliance therapy. If you have questions about sleep apnea therapy in Herndon and you’re interested in learning more about oral appliances, contact Virginia Dentistry By Design to schedule a consultation with Dr. Dilolli.